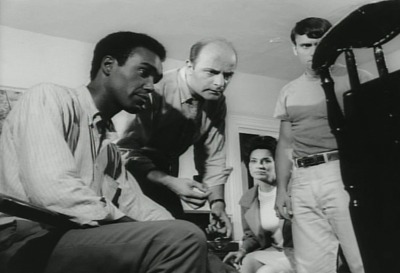 31 Days of Horror - Day 8 "Night of the Living Dead"
It's hard to be a horror fan and not love this movie. It's just oozing with atmosphere and has a good social message on both race and gender. I love how each of the character's end up being introduced so naturally. And there's something about Black and White movies that will always hold a certain charm. The acting can be a little stiff but something about the material elevates it to still create a satisfying movie. I just love the atmosphere that Romero is always able to achieve with his movies. Putting yourself in the situation at hand is what he does best and this film really takes advantage of that line of thinking. I'm one of those people that love Romero's Dead trilogy. Sure, he falls off the wagon with the second half of his series, but still those original three are legendary. Each of them are so different while still commenting on the decade from which it came. I've only ever seen the Tom Savini remake once but I think it proves why the first one works so well: the simplicity. Everything gets too complicated in the remake and the charm is drawn out.